Our original article was published in BMC Medical Genomics in the supplement containing selected articles from the IEEE International Conference on Bioinformatics and Biomedicine 2012 (IEEE BIBM 2012) . After publication, it was noticed that the ROC curves in Figures 1, 2, 3, 4 displayed Sensitivity vs. Specificity rather than Sensitivity vs. 1-Specificity, as labeled. These figures have been reproduced here in the correct format, displaying Sensitivity vs. 1-Specificity, and should replace the corresponding figures in the original article. However, AUC values remain unaffected by this change. ROC curves based on multivariable stepwise penalized logistic regression models ( stepPLR ) using the stratified male-only subset. The age-adjusted final model for λ = 0.1 showed the best performance in terms of AUC. 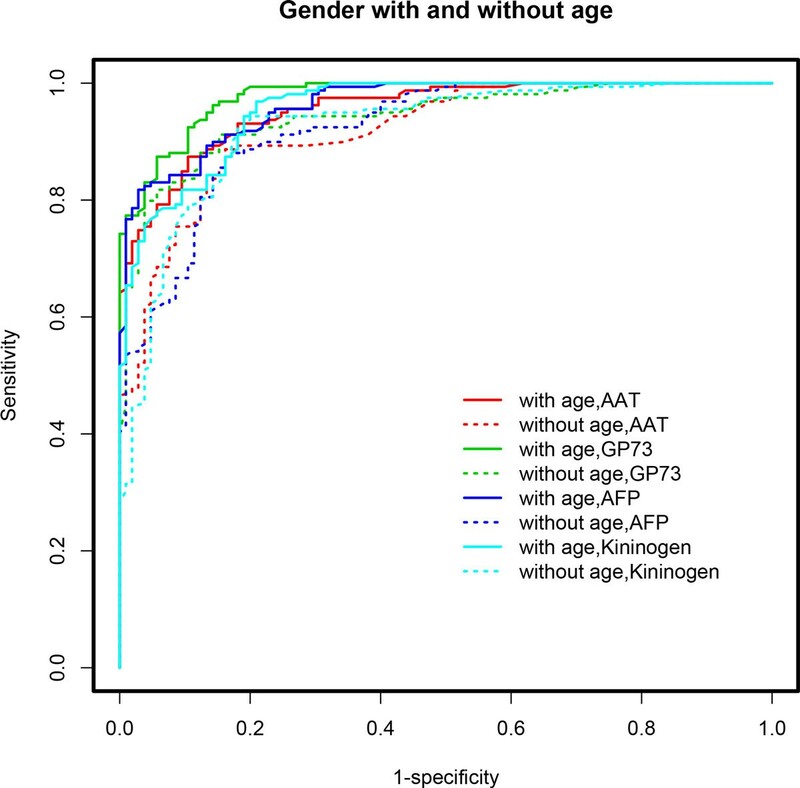 A clear distinction is seen in the ROC curves for age-adjusted models compared to age-unadjusted models. 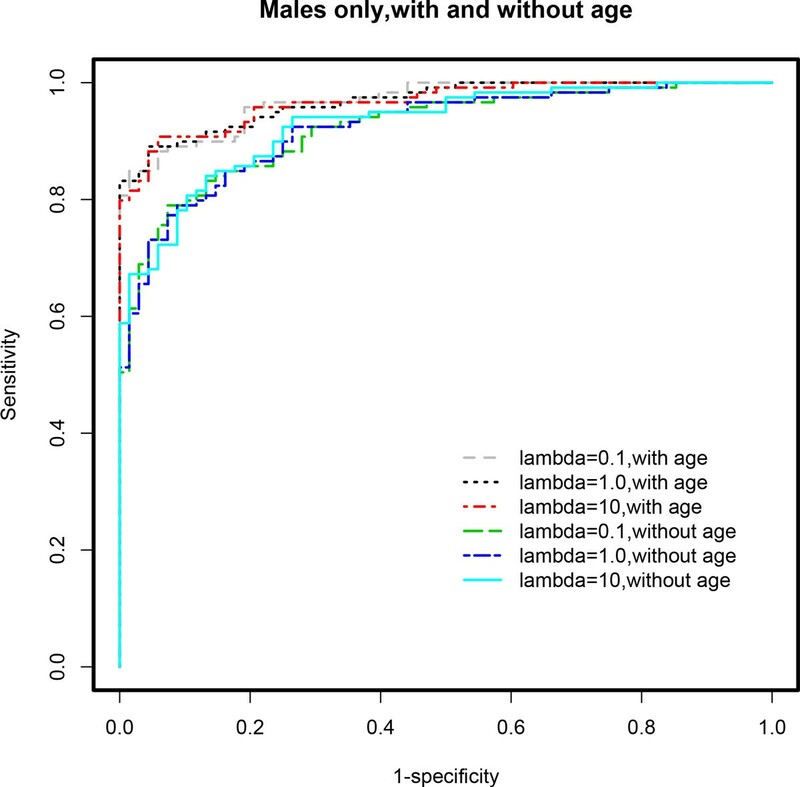 Age-adjusted models demonstrated superior performance overall across all choices of λ. See Table 1 for detailed results and the text for discussion of these results. ROC curves based on multivariable stepwise penalized logistic regression models ( stepPLR ) adjusting for gender effect. Models that are also adjusted for age effect outperformed those that did not control for age, across all choices of the parameter λ. The age-adjusted final model for λ = 0.1 showed the best performance in terms of AUC. See Table 1 for detailed results and the text for discussion of these results. 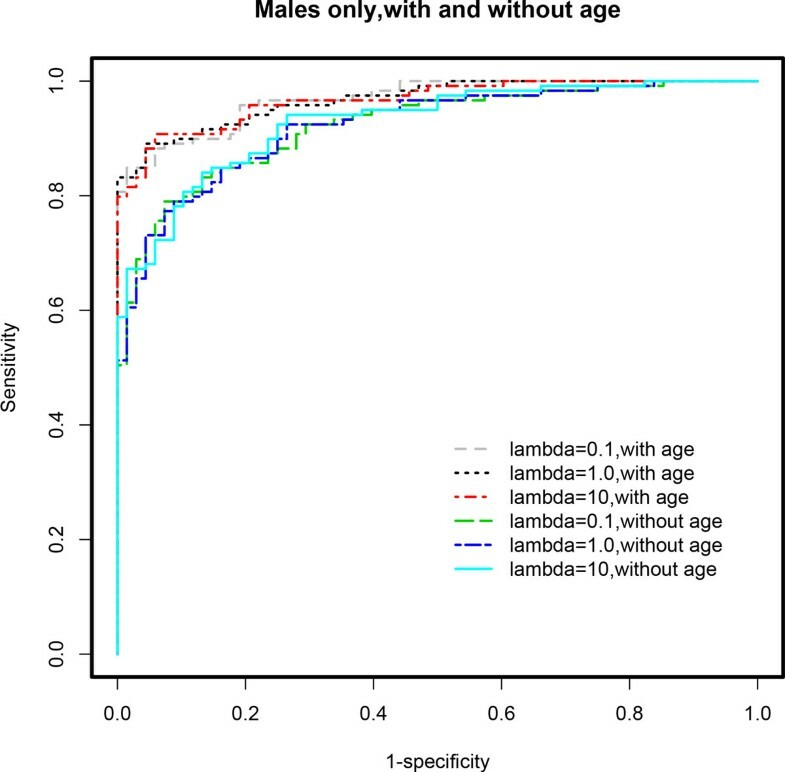 ROC curves based on multivariable model-based CART analyses ( mob ) using the stratified male-only subset. 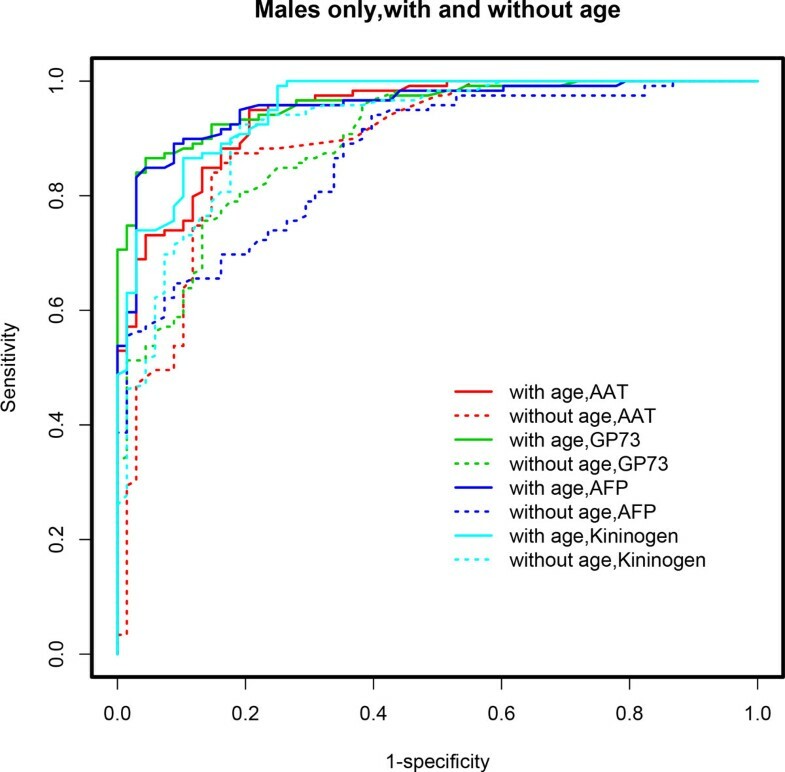 Age-adjusted models demonstrated superior performance in terms of AUC. A clear distinction is seen in the ROC curves for age-adjusted models (solid lines) compared to age-unadjusted models (dotted lines). See Table 1 for detailed results and the text for discussion of these results. 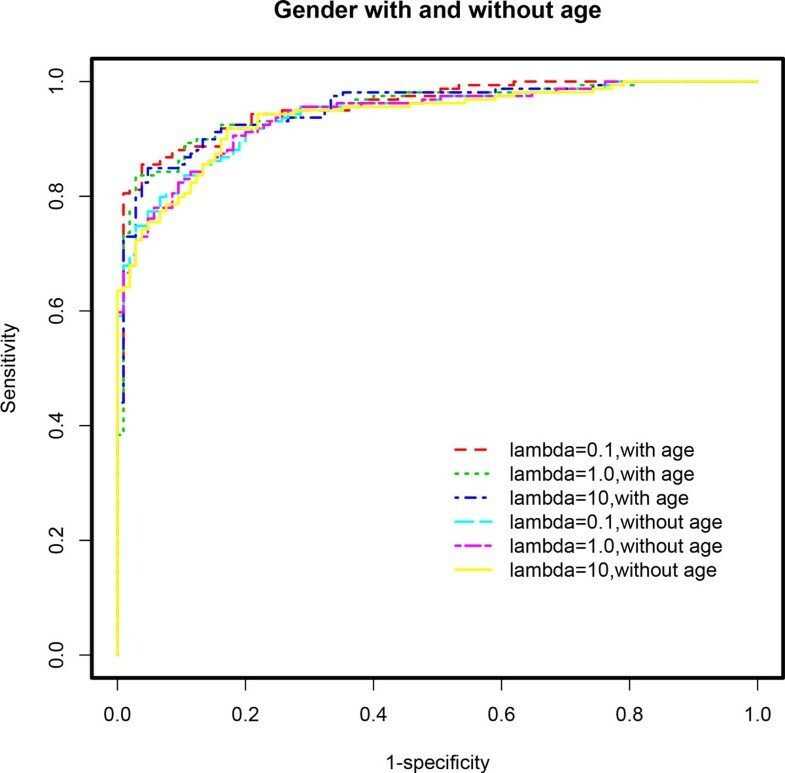 ROC curves based on multivariable model-based CART analyses ( mob ) incorporating gender and/or age. Age-adjusted models demonstrated superior performance in terms of AUC when gender effect is accounted for in each model. A clear distinction is seen in the ROC curves for age-adjusted models (solid lines) compared to age-unadjusted models (dotted lines). Table 1 lists the performance measures for these models. A detailed discussion of the results is provided in the text.